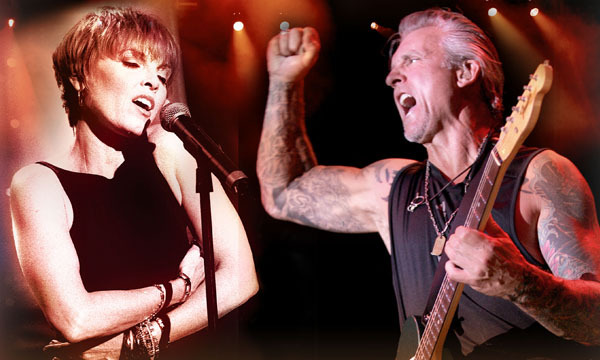 TICKETHOLDERS: The Pat Benatar & Neil Giraldo concert scheduled for Sunday, August 19 has been relocated from the Arkansas Music Pavilion to Walton Arts Center’s Baum Walker Hall (View Map). The start time for this performance has been moved from 7:30pm to 7pm. Gates will open at 6:30pm. The Walton Arts Center Box Office is currently in the process of calling ticket purchasers to let them know of their new seats. If you have any questions, give us a call at 479.443.5600. If you have any special needs, please inform the Ticket Representative when you are contacted or email the Box Office at boxoffice@waltonartscenter.org. We’re looking forward to seeing you at Walton Arts Center for this night of great music! Follow us on Twitter @AMP_Concerts ! The AMP 2012 season is sponsored by Procter & Gamble, General Mills, A.W. Bravis Marketing Agency, Whittle Family Business, Courtyard Marriott, Liberty Bank of Arkansas, Premium Brands of Northwest Arkansas, Edy's Icecream, INTENTS Party Rental, Nickelodeon, Volvo Cars of North America, LLC, Subway, Smith Two Way Radio, Nightflying, Eventures Party Rentals, Budweiser, Core Architects, Riders United 4 Children, Mercy Health System, KNWA Northwest Arkansas News, Cox Media, NWA Media, Celebrate Magazine, Citiscapes Magazine, Clear Channel Outdoor, Inc., Clear Channel Communications, Fox 24, Hot Mix 101.9, The Eagle 93.3, KIX 104, Magic 107.9, Dale Caudle, Hershey and Denise Garner, John Ervin, and Mark Richardson.